If you can improve 1% every day, in 100 days you'll be 100% better. Craig Winston teaches guitar, bass, and ukulele lessons focusing on contemporary rock, jazz, blues, and folk. He began teaching private lessons in 2013 with the belief that the best way to learn music is by studying the music we love. He is excited to share his expertise with students of the Lesson Studio at Music & Arts. Craig’s extensive performance experience has taken him around the country touring with Chicago chamber-rockers The Dead Superheroes Orchestra, heavy art-rockers The Walking Shadows, and Portland based synth-pop group The Gentry. He has composed, recorded, and produced three albums, and played multiple instruments on several others. He has performed in theater productions as a pit musician, composer, and music director. Mr. Winston is also an avid music writer for his blog “Surviving the Guitarmageddon,” which includes guitar lessons, interviews, and tips for professional musicians. 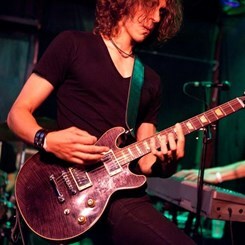 Craig took his first private lessons at the age of ten learning classical and rock guitar. His love of music inspired him to attend Berklee College of Music and Lewis & Clark College, where he studied guitar performance, Music Technology, Songwriting, and Jazz theory. In 2013 he attended Paul Gilbert’s “Great Guitar Escape,” where he had the good fortune to take lessons and master classes with guitar legends Paul Gilbert, Andy Timmons, and Mimi Fox. Craig believes that it is thanks to the work of great teachers that we are able to overcome creative barriers and find the insight to reach our real potential.